3/8” x 25 ’, 50’, 100’ or 200’ extension hose with 4000 PSI working pressure. Its rugged wrap cover, steel wire braid construction helps resist wear and extend product life. They are perfect for the job site when you do not want to waste time to reposition your equipment. Whatever your application, we can help you size the right hose and fittings to get the job done. 1/4” x 50 ’, 100’, 125’ or 150’ extension hose with 4000 PSI working pressure. 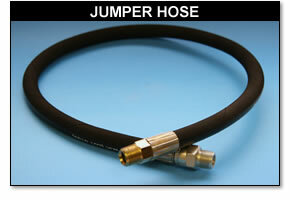 3/8” x 2 ’, 4’, 6’ or 8’ jumper hose with 4000 PSI working pressure. 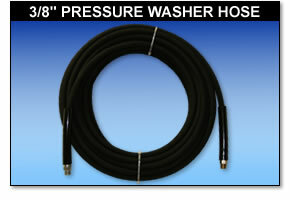 Its rugged wrap cover, steel wire braid construction helps resist wear and extend product life of the main hose. Whatever your application, we can help you size the right hose and fittings to get the job done.